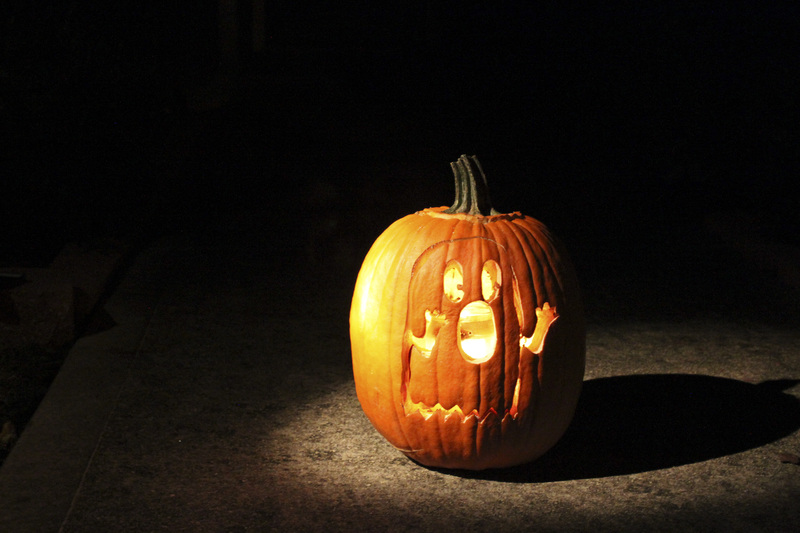 Jack-O-Lanterns are a great Halloween decoration as well as a fun tradition to carve out creative, cool faces. Every year Halloween comes around, and the slight panic of what you’re going to do crosses your mind. There are so many different things to do Halloween night, especially since it falls on a Friday this year. Don’t waste an opportunity like this doing nothing! Since, Halloween is one of those cool times you’re almost always guaranteed something to do, go out with your friends. Even if you feel like having a night in you can still have a great time! Don’t know what to do? Don’t freak out! Here’s a guide to how you can spend your Halloween and make it a great and memorable! When throwing a Halloween Party there are a couple essentials you need know. Follow these tips to have an incredible night! 1.) Figure out Your Costume: As the host, dressing up in a costume is expected. Try to plan ahead so you have time to put your costume together efficiently. Don’t wait until the day before Halloween to get everything! You might miss out and the wig you were planning on getting to complete your look is sold out. 2.) What’s the Theme? : Pick a theme for your party. Try a movie theme where everyone comes dressed as a character from any movie or one specific movie, or a vampire theme. Make sure the decorations go with the theme as well so that everything flows together. 3.) The Guest List: You are obviously going to need people at your party! If you want to have something small invite just your closest friends, but if you want something big invite your closest friends and tell them to bring their friends! If that is not enough use social media to get the word out about your Halloween party. Shout it out on Instagram, Twitter, and/or Facebook. 4.) Candy: What is Halloween without candy? Candy is a must, Halloween-themed treats are even better! Major fan favorite Halloween candies are candy corn, fun size snickers, M&Ms;, and Reese’s. Here are two cool and easy treats to make for your guests. Step 1. Use a sharp knife to cut the two curved sides off a pretzel. Step 2. Carefully push 8 pretzel curves into the top of a mini doughnut to form legs. Step 3. Melt a little chocolate in a sandwich bag or place a bit of frosting in a sandwich bag.lip off a tiny corner and squeeze some chocolate/frosting onto the mini donut. Step 4. Stick two M&Ms; on for eyes. Step 1.) Melt the white chocolate and stir until smooth. Cool slightly. Step 2.) Stir in marshmallows until they are coated. Step 3.) Drop tablespoonfuls onto the wax paper. Smooth and flatten into ghost shapes. Step 4.) Decorate your treats with the gel for eyes and you are done! 5.) Snacks: Your guests are eventually going to get hungry. Put out some snacks for them to enjoy. Different kinds of snacks and an assortment of drinks should keep your guests satisfied. Think of some festive ones like candy apples, orange filled Oreo’s and popcorn balls. If you don’t want to be the provider for snacks tell everyone to bring at least one thing. That way you’ll have enough food for everyone as well as a diverse selection. Here’s a recipe for a fun drink idea you can make on your own to serve to your guests. Step 1.) Stir sugar and water together in a punch bowl until sugar is dissolves. Step 2.) Stir in remaining ingredients. Let chill. Step 3.) Place the punch bowl on top of a bowl of dry ice. You’ll give the drink that eerie feeling which is perfect for a Halloween party. 7.) Decorations: Who wants to be at a dull-looking Halloween party? Get creative with the decorations! If you’re on a budget make them yourself. Fill jars with bright colored candies or hang strings of lights against the walls and then cover them with ghost cut outs making them look spooky! 8.) Drinking/Party Games: If you’re going to be drinking at your party here are some awesome games you can play. Beer Pong: decorate your beer pong table or apply the theme of the party to it. For example if the theme of the party is Twilight, dye your beer with red food coloring and have two teams, Team Edward and Team Jacob. Murder Mystery game: a murder mystery game can be awesome and suspenseful at the same time, especially when you’re with your friends. Come up with a way to decide who’s going to be the victim, the murderer, and how the victim was murdered. Write out each thing on pieces of paper and put them in a bowl. Have everyone randomly select the pieces from that bowl, and let the game begin! Jenga: If you have the game it’s better to play it as a drinking game. Divide the teams with boys against girls, and see how intense the game can truly be. Whoever loses has to take drink of whatever alcohol concoction you want to serve up. Throwing a Halloween party could be constituted as a night in, but sometimes parties aren’t everyone. Instead of going out, snuggle up in your bed or on your couch with your friends and watch some Halloween classics. Here a few of the best Halloween movies to watch. Bar hop several of the bars in the Virginia Highlands. Bars included: Neighbor’s Pub, Hand in Hand, 10 HIGH, Limerick Junction, Dark Horse Tavern, Diesel, 10 High & Sweet Auburn BBQ. Oct. 31 at Atlantic Station’s Central Park they will be showing Hocus Pocus. It’s FREE! And you can bring snacks and a blanket to watch the film. Don’t celebrate Halloween by yourself unless you really want to. The holiday is a great way to get all your friends together regardless of what the plan is. Especially if your plan is to go trick or treating. There is no shame in going trick or treating once you’re over 18. Get dressed up and have fun! If you do go out trick or treating with friends or with children make sure everyone wears a bright colored costume or wears something that can easily be seen at night. A lot of neighborhoods don’t have street lights and you don’t want to risk getting hit by a car. Do not overdo it on the candy. Especially those who are 21 and older and are going to be drinking a lot that night. A belly full of chocolate does not mix with alcohol. Do not overdo it on the alcohol. If you plan to drink, drink at home, make sure to have a designated driver with you or have a taxi cab number entered in your phone before you reach the point of no return. Girls, do not go anywhere by yourself under the influence or sober. This goes for guys too. This makes it easier for anyone to attack you. Use the buddy system, and make smart decisions.